WILMINGTON — The 63-year-old Wilmington Marine Services boatyard on South Fries Avenue appears to be following in the footsteps of the recently closed Colonial Yacht Anchorage and boatyard. It has received an eviction notice from the Port of Los Angeles. 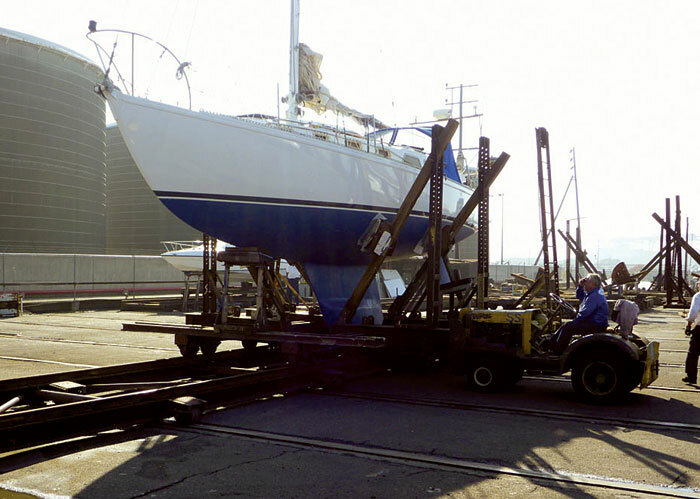 The marine service facility — also known as Dinko’s Boat Repair, after its owner Dominic “Dinko” Bilicich — is the last boatyard in the Port of Los Angeles catering to smaller vessels. The move appears to be part of a trend to de-emphasize recreational boating at the port, which is currently focusing on container shipping terminal expansion. Last February, as the boatyard’s profits decreased and discussions of a long-term lease for the yard came to a halt, the company stopped paying rent to the port, which led to the recent eviction process. Before an eviction date can be set, the port must first obtain a judgment for possession in an unlawful detainer proceeding, and then the court will set an eviction date. Once the eviction date is set, port spokesman Phillip Sanfield said boat owners who currently have their vessels on the boatyard site will need to make plans to remove their boats. In the meantime, Bilicich has maintained the yard in working order, and he continues to hold out for a miracle. Since 1951, Bilicich has worked at the full-service yard. He started in the business at a young age and worked at several boatyards throughout Southern California, gaining experience in custom fiberglass work, wooden boats, joinerwork and a full range of shipwright skills. When he was asked to partner with the yard’s previous owners, Bilicich jumped at the chance. Over the years, Bilicich slowly bought out each partner until the yard was his. Throughout his years of ownership, Bilicich said the yard has never had more than a five-year lease. That lease ran out in 1971, and he has operated on a month-to-month basis ever since. The agreement with port officials worked well until the 1990s, when Bilicich said the construction of the nearby Wilmington Waterfront Park began, and the street leading to his boatyard was obstructed. “They destroyed this place when they started constructing that park,” Bilicich said. Lines of trucks and equipment coming in would park on the street and block access to his yard, he said, deterring customers from coming to the yard, due to the extended waits. On top of that, Bilicich said rent has more than doubled on his 2.5-acre lot in the last five years, making rent payments increasingly difficult to make. With the situation worsening, Bilicich said he has been looking for a buyer to purchase the yard — but without a long-term lease in hand, the site’s value is diminished. With business still on the decline, Bilicich said he hasn’t been paid himself for the past three years. According to his count, Bilicich owes more than $100,000 to the harbor department in rent payments he did not make when the road was closed due to the park construction. “When the road was messed up and they locked me out, that’s when I didn’t pay,” Bilicich said. ← Will Oceanside Change Its Slip Transfer Policy?